It’s always disappointing to see any cemetery neglected, but this one is a fairly large one, with almost 200 interments in it, the Find A Grave website shows. The good news is that recent Google Earth photos show that it’s in much better shape today. Somewhere along the line, I heard a story about a rich man who had been buried in this cemetery. Local legend was that the man had a fair amount of money and had always said he was going to take it with him. After he was put on the dark side of the dirt, it was said that his grave was dug up by someones unknown who thought that live crooks could better spend the stash than a dead man. I don’t remember if anyone ever said if there was any treasure found, whether the grave was successfully dug up or any any other juicy details. The other piece of the story was that when he was planted again, this time his grave had a huge concrete slab poured over it. I’m pretty sure I’ve seen the slab, but I can’t locate any photos of it. There are lots of interesting stories about cemeteries in the Advance area. There was once a family cemetery on the town square in Advance. The tombstones all mysteriously disappeared in the middle of the night. Nobody in town would give up the culprits. Even my mother and Daisy, who were wired in, claimed no knowledge of what happened to the stones. 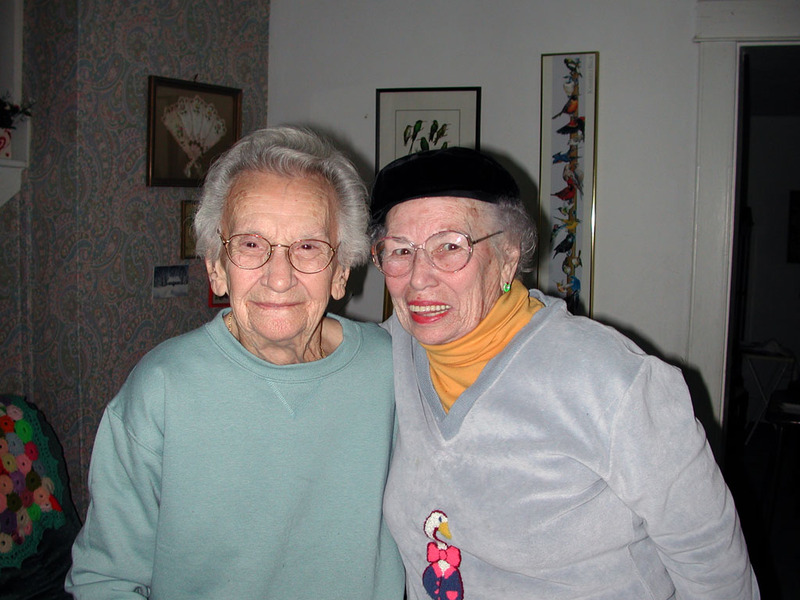 Daisy, left, is no longer with us, so she kept the town’s secret to the end, if she ever knew it. Having a cemetery come back from the dead, so to speak, is a rare thing I would think. I’ve seen several that seem to have little hope left to be used again or to be properly kept up. A member of our motorcycle group likes to plan trips to cemeteries that have unusual head stones or stories associated with them. My genealogy activities have taken me to some that have become grazing for cattle and others that are overgrown and seem to be abandoned. The Cotter Cemetery at Neely’s Landing that was mentioned in one of the previous posts is no longer being used and slowly being overgrown. 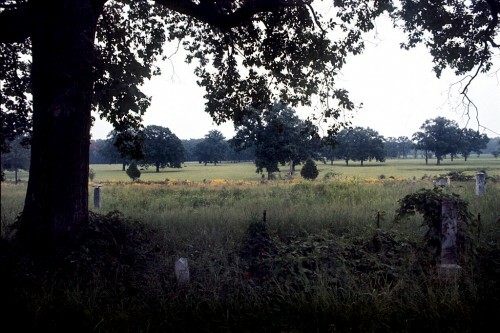 The Noland Cemetery near the KFVS tower is all but gone and the Grammer Cemetery located South of Neely’s Landing disappeared all together when it was in the way of the railroad being built along the Mississippi River. Data is lost when this happens but most of all stories and links to the past that tell us where we came from and why we are here. Another you might be interested in that few people know is there is located up a trail that leads away from the Bollinger Mill . I’m really enjoying your efforts here and appreciate you letting me participate. This cemetery is on my “To do” list, at the urging of Toga resident Gary Davault. Once again, you come out with a story that makes me feel like a slacker for not having covered it sooner! Always nipping at my heels, aren’t you, Ken?? I’m working on an Advance story that you’ve touched on in the past. Give me a holler when you get back to civilization and we can compare notes. P.S. We’re on the road back to Advance today, so if you could share some Florida sunshine with us, it would be greatly appreciated! 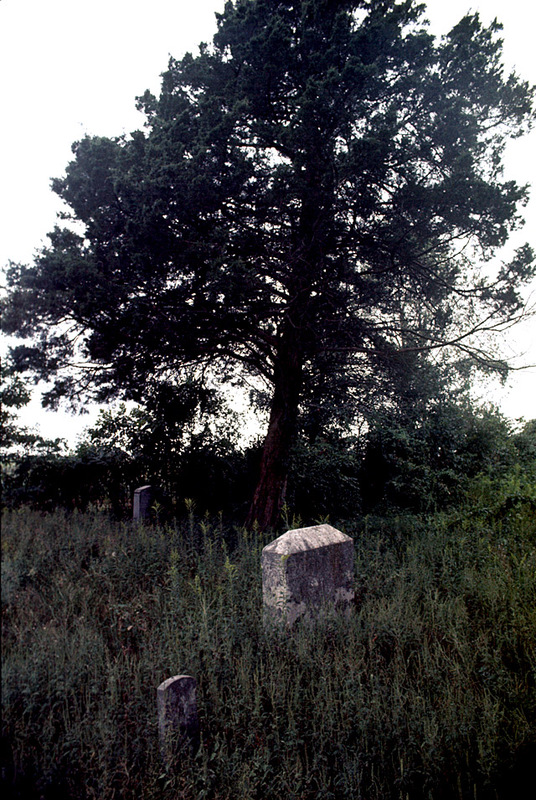 The cemetery behind the mill is where our Vandivort/Bollinger ancestors are buried – specifically, Sarah Bolling Frizel Daugherty, George Frederick Bollinger, and others of this generation. (George is the one who received the Spanish land-grant to settle the area and brought 100 settlers from North Carolina to establish a colony.) Many summers during our annual July 4th Vandivort Family reunion we visit the cemetery and tell our children and grandchildren the stories of their brave ancestors. Our family cherishes that cemetery as a reminder of our heritage and the courage of the men and women who crossed the frozen Mississippi River at St. Genevieve, Missouri on January 1, 1800, to begin a trek that would take them to the Cape Girardeau area and begin a family that will forever be in their debt. And a few miles west on Rt. 34, if you take the gravel road to the right just before Dillard’s Creek, one will find the Gravel Hill Cemetery on a knoll with a scenic overlook of the country side. In it is a tombstone for a nine year old girl who died in the 1880s. Upon the stone is this eroded inscription: “Beautiful lovely she was but given, a fair bud to earth to bloom in heaven”. Standing alone at such a stone, in such a setting, imagining shared grief gathered round so long ago, one is drawn to the emotional ties which bond we humans one to another. Fortunately, relatives of my great aunt, who was buried there in the 1960s, came together and formed a trust which will maintain the cemetery in perpetuity. Larry……how touching. Thank you for sharing. I know this cemetery well, as several members from my Mother’s ancestry are buried there. By the way, I know what the sign says, but I have only heard the settlement called Togy, never Toga. Mom’s family lived south(the side with the mill) of Highway 25 on the same road as the cemetery, that is north of 25. 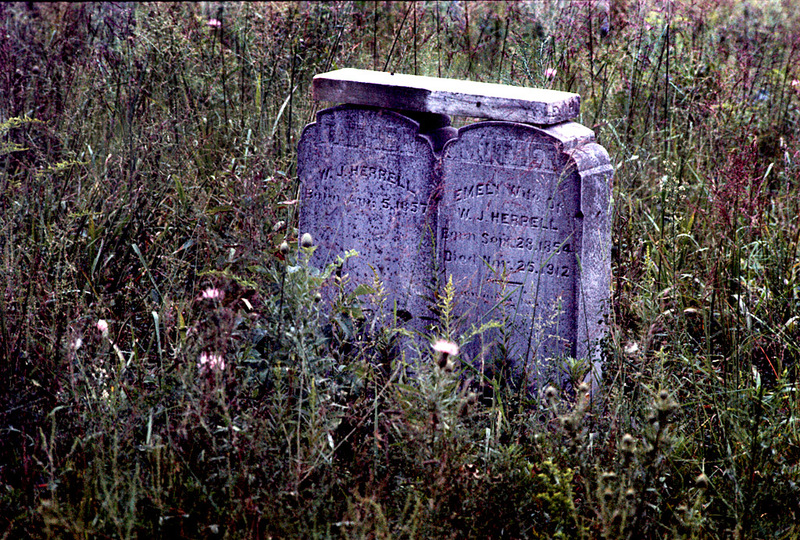 My great Grandfather and Grandmother, Jerome and Emma Kappler Farrar, are buried there. Also Emma’s parents, my great-great Grandfather and Grandmother, Jacob and Anna Tropf Kappler are buried there as are some other family. Several Welchs are buried there as you probably know. Lots of names familiar to Advance old timers are there: Croy, Revelle, Carlton, Jenkins, Morgan, Zimmerman, Lanpher, Tropfs and many more. There is a book of Stoddard Co. cemeteries that is helpful to genealogists. The person you reference whose grave was disturbed sounds like Reuben Guy. He was known to carry a lot of money. But I think the grave that was disturbed was his wife’s, Josephine. It was thought she was buried with a lot of jewelry. Rube and Josephine had no children and were well off financially. My Granddad Frank had a story about Rube showing him money he had washed because it was moldy from being buried. Money was hanging all over an upstairs room on several lines. My Mother had some stories about Mr. Guy too. He would chase them with an ax raised over his head, growling, as they went screaming in all directions. He thought that was funny while they were scared spitless. Mr. Guy gave the kids rides sometimes and they always thanked him. His standard answer was, “Thanks don’t buy the gas.” One time after he said that, they threw a penny on the floor of the car and took off running. Mom said he was enraged, yelling that he didn’t want their “damn money” as they ran away fast. I will try to find the answer to the question about the grave for you. I too heard about the tombstones in the town square disappearing. My Dad thinks they were taken to the block hole and dumped. But he has no firsthand knowledge about that, just stories he has heard. Another story is they were put on a train that was heading out of town. Thanks for clearing that up. It’s obvious that I either misheard the original story or it was garbled in the telling. Either way, it’s amazing how something that looks so peaceful and benign could harbor so many bizarre stories. I checked some of my Granddad Frank Farrar’s papers and found he was the executor of Reuben Guy’s will. I thought that was the case but hesitated to give any unsubstantiated facts. Granddad was so upset that Josie Guy’s grave had been disturbed, he ordered Rube’s grave be lined with cement and a slab placed on top of it. That was to prevent the same thing from happening to Reuben Guy. Rube’s grave was never bothered, only his wife Josephine’s was. Josie died in 1947 and Rube died in 1954. Is there a list of the people and location where buried in the Cruse Cemetery on co. rd. 203, north of Toga, Mo.? My brother, Calvin Jordan is buried there and I could not find a head-stone. I appreciate any help from anyone. I went to findagrave.com and found a listing for Calvin Jordan, but it doesn’t show a location. Maybe Sheryl can point you in the right direction. Good luck. Mr. Steinhoff, thank you for the information about the Cruse cemetery and my brother, Calvin Jordan who is buried there and I was not aware that my uncle, Delmar Jordan is also buried there. I went there today, walked over the entire cemetery and as I was walking to my vehicle, I found his headstone near the center of the cemetery. I’ll have to do some research on my uncle’s grave site. So, I’m thanking you double for the information. I do appreciate your help. Glad to be of help. I have a soft spot for old cemeteries. Did you check the findagrave website link? It has the death certificate for Delmar Jordan. I have not yet checked, findagrave website, but plan to do so right away. And thanks again. I think that Daisy Zimmerman must have known who took the tombstones, as I heard that her husband “Salty” certainly did know! However, they are both long gone, so the mystery is still unsolved!